A mention of flatulence might conjure up images of bratty high school boys or lowbrow comics. But one of the most eloquent--and least expected--commentators on the subject is Benjamin Franklin. The writings in Fart Proudly reveal the rogue who lived peaceably within the philosopher and statesman. Included are "The Letter to a Royal Academy"; "On Choosing a Mistress"; "Rules on Making Oneself Disagreeable"; and other jibes. Franklin's irrepressible wit found an outlet in perpetrating hoaxes, attacking marriage and other sacred cows, and skewering the English Parliament. 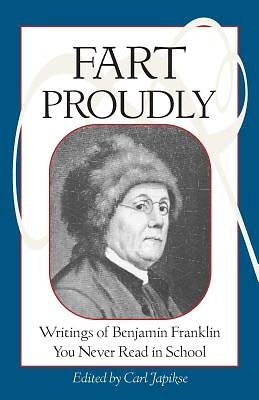 Reminding us of the humorous, irreverent side of this American icon, these essays endure as both hilarious satire and a timely reminder of the importance of a free press.